Resolutions are made to be broken. I was supposed to drop ten pounds in 2016, but instead, I found room for ten more. I began 2016 volunteering more of my time, but that soon gave way to chauffeuring my son to tutoring. I wanted to spend more time with the fam, but my nieces keep getting older and we never got around to our girls' weekend of pizza and anime. So what is it about resolutions that makes them impossible to keep? Life is messy. Too messy to plan specifically. The unexpected comes up and its urgency tramples the best laid plans. Maybe my resolutions were too specific. Maybe they need to be more general so that I can find a way to success. Instead of "lose ten pounds," I'll try "be more active." Instead of "volunteer once a week," I'll try "be more generous with my time when I can." Instead of "have a girls' weekend" with two hopelessly busy teenagers, I'll try "spend more quality time with family." But how can this apply to my classroom? I know I need to do a better job on several fronts. 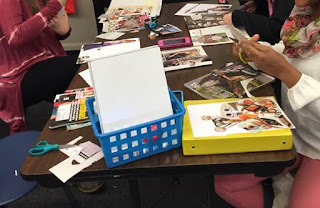 I know I need to be more organized, do better at differentiation, do a better job at connecting with my students and their parents, so how can I make these things work? I don't want to give up on resolutions, but I don't want to set myself up for failure, either. I have a broad plan this year to set myself up for success. Very simply put, this year, I intend to embrace my lack of it. I won't waste hours filing and labeling, and working against my nature to make everything look pretty. That takes too much time away from the things that truly matter, like planning and making connections. And it's a losing battle for me. I will stop apologizing for my messy desk. I know where everything is, and it works for me, so I'm going with it. I will keep the piles on my desk. I just need to remember to recycle the things at the bottom of the piles periodically. If they're at the bottom, I probably don't use them. I've found that generally my best lessons that engage the students most are the messiest. I will not apologize for being messy in 2017. I just finished reading a book that I got for Christmas that beautifully demonstrates the normalcy of messes--Messy: The Power of Disorder to Transform Our Lives by Tim Harford. I will re-read it at midyear. Differentiation is so important, and in the age of technology, it's easier to implement than ever. 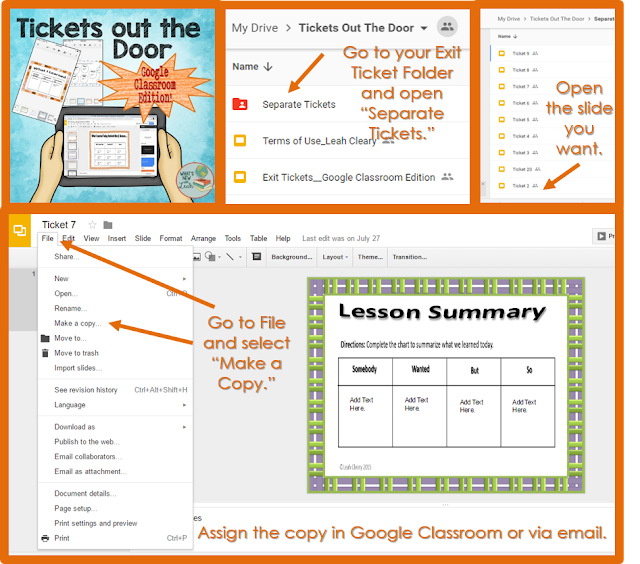 Exit tickets are a quick way to do it and so is the exit quiz. All I need to do is assign an exit ticket or quiz the last five minutes of class to see what I might need to reteach to whom--easy, right? Well, yes and no. My issues tend to go back to organization (and my struggles with it). In this case, it's time management. I'll have the exit tickets ready to go, but then the bell sneaks up on me. Google Forms now has a self grading quiz option (not the old add-on Flubaroo) that gives students instant feedback. I will use these for those five minute exit quizzes to see if students understand the crux of the lesson. I'll put a tutorial up on how to do this next week--it's super easy if you don't already know. I also organized my digital exit tickets into single slides so that it's effortless to assign one at a time. I can just make a copy and assign it without having to delete all of the slides I'm not using. 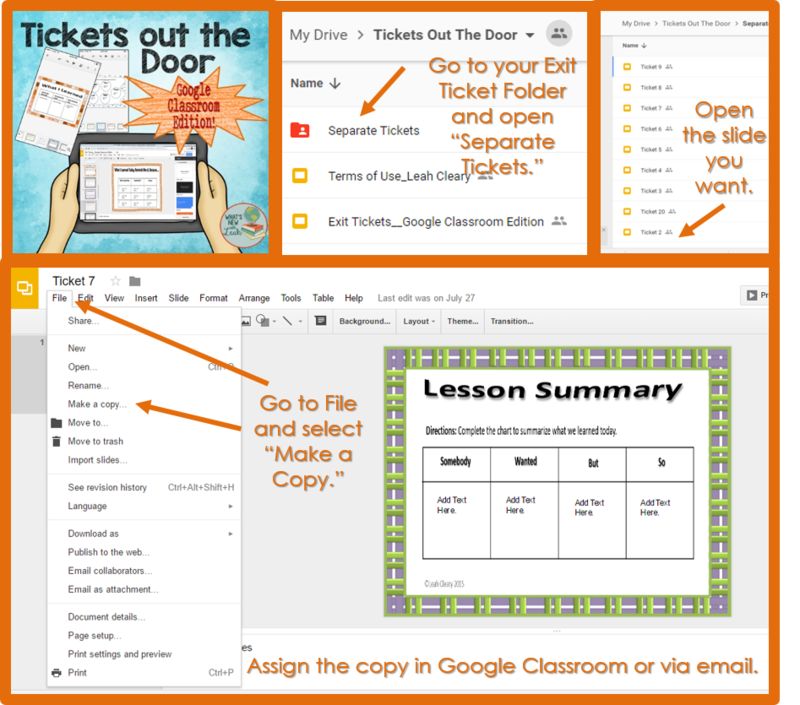 You can find the pre-made Digital Exit Tickets HERE. I always fall into the same trap each year--calling only when there's a problem. My goal this year is to connect with parents each week for positive feedback (notice I'm not giving an exact number, that way, if it's a busy week and I've only made contact with one or two parents, I haven't failed). I also want to continue my efforts to center aspects of lessons around student's interests (I talked about that HERE) and to really listen to them and foster positive discussions. Oh yeah--let's not forget to have fun in 2017! Because we do have a fun job, and it's easy to forget. 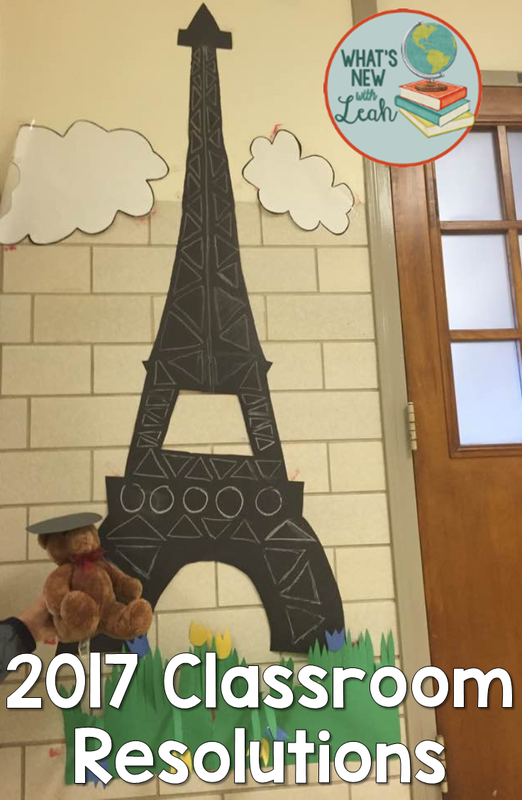 So I want to close this post by talking about a really fun, extemporaneous thing that went on in my classroom in 2016. One of my students got a teddy bear from his girlfriend on Valentine's Day. He had it in class, and it was causing quite the disruption, so I confiscated it. The bell rang, and I realized that I still had his bear. I meant to give it back to him at the end of class but forgot. It was my planning block, and I had tons of stuff to do, but instead I took the bear up and down my hallway. 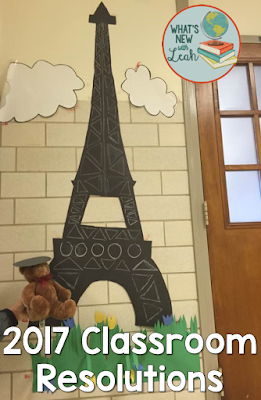 I teach on the social studies/ foreign language floor, so teachers have a ton of props. I went from room to room, photographing the bear with different props. I made memes about them. The next day, my student entered class and asked for his bear. I told him I wasn't sure where the bear went, but that I kept getting these crazy postcards from him. I pointed to the screen at the front of my room, and there was one of the memes projected. He laughed and sat down. I wish you all a happy, healthy, safe, productive, fun, and messy 2017! I know we’re not supposed to play favorites with the kids, but I can’t help it. I have six kids, but I most definitely have a favorite. Respectively, my kids are English I, English III, U.S. History, World History, Sociology, and Psychology. I love them all, truly I do—I’ve spent so much time with each, reading, planning, and teaching, so they really do all feel like my kids--but if I had to pick one to spend the most time with, it would be world history. “Why?” you might ask, especially when they are all wonderful and English was my first. Well, I think it may have something to do with what drew me to English in the first place—stories. World history is a bunch of wonderful, disturbing, beautiful, tragic, funny stories. They are stories that explain who and where we are and how we got here. They are stories that connect people in the U.S. to people in Estonia, and people in Nigeria to people in Malaysia. 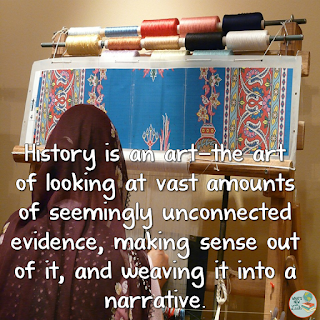 Also, history is an art—the art of looking at vast amounts of seemingly unconnected evidence, making sense out of it, and weaving it into a narrative. I think that is what I truly enjoy doing and encouraging students to do. I love it when they say, “History doesn’t change.” My challenge is to have them question that assumption by the end of the term. I want them to see that when they read a textbook or an online article, they are looking at one person’s (or an editorial board’s) interpretation of evidence. While events and primary sources may not change, interpretations of those events and sources are wide-open to change. 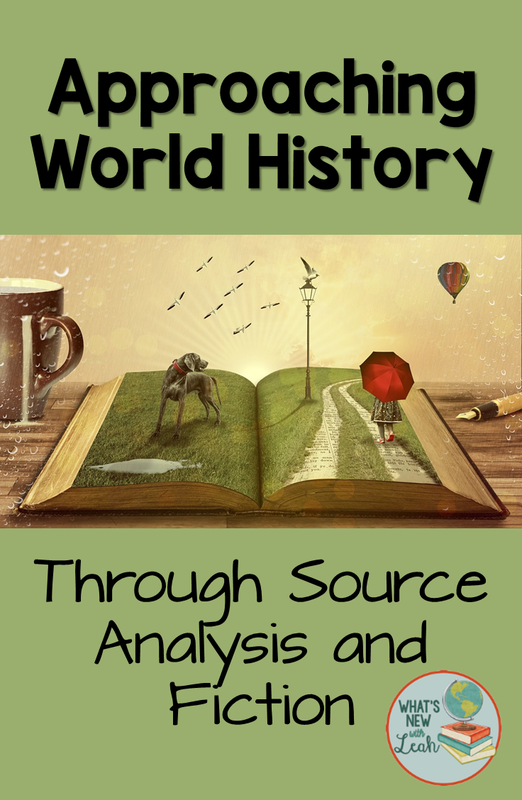 Keeping that in mind, there are a couple of approaches to teaching world history that I like to take: 1. implementing primary and secondary source analysis and 2. bringing short fiction into the curriculum to illustrate points and approaches. The first approach is vital to any world history curriculum. The best way to make students aware of the historical process is to have them engage in it. First, students must understand the difference between primary and secondary sources. I give a brief lecture about the difference and then guide students through a process of analyzing a primary source (we do this together). Then, I put students in groups of four and give each group a set of task cards. They have to determine whether the source on each card is primary or secondary and explain why they answered as they did. To take it a step further (and really demonstrate using evidence to draw conclusions), I like to pair students off and give each pair a copy of a receipt. They have to look at the purchases on the receipt and construct a narrative about the person doing the shopping based on the purchases. It’s fun to have an actual personality sketch of the person behind the receipt so that students can compare their narrative to the actual person and see how close they came to accuracy. I cinch the lesson by explaining that this is what historians do. They may be right, wrong, or close, but they have to have evidence from primary sources, and their claims should be reasonable based on that evidence, or it is not a reliable source. I like to use snippets from various secondary sources, all with differing assertions about the same topic, for students to compare. A topic that fits the world history curriculum and lends itself to differing opinions based on primary source evidence is the fall of Rome. It’s difficult to find two historians who agree as to why it fell, let alone if it fell at all. Students need to see that the narratives we hear in history class are conclusions woven from evidence. They should engage in the process so that they can unweave the narratives and see the individual yarns from which they are created. This will make them more discerning in what they accept as fact. The second approach I like to take uses short fiction to illustrate the humanity of the people and cultures we are studying. I knew I wanted to do something along these lines the first time I taught world history. The students couldn’t wait to get to the Holocaust. I was perplexed by their excitement over such a horrific subject. “I love the Holocaust,” I heard more than once. “Really?” I would say. This troubled me. I thought a lot about it. There are three reasons my somewhat limited mind could fathom that someone would “love” the Holocaust: 1. they are truly depraved, 2. they enjoy the feelings of superiority that “good vs. bad” scenarios give us all (we would never engage in something as horrendous as that—we would help), and 3. they are genuinely missing the human element in this calamity. But that excuse neglects one important truth—it still happens. Ask the Syrian migrants flooding into Europe. Visit the Sudan. Or just watch Hotel Rwanda. That excuse insults the masses still enduring genocide, and it gives us a false sense of the times in which we live. So that leaves us with category three. I think that many of us get swept up in the atrocities and neglect the human element. Actual people were tortured and killed. Actual families were ripped apart. And that is why we study the Holocaust and other such atrocities—to remember and honor the victims. I could tell my students this, but I don’t think it would mean much to them. I chose to illustrate the point with a short story instead. 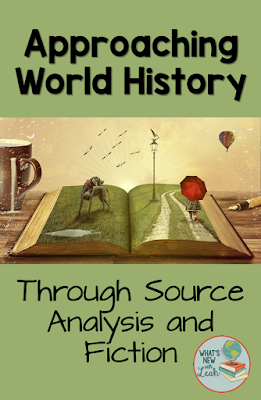 Many of us have brought historical fiction into a history class, but I think an effective way to discuss historical themes and approaches can be through short fiction. Before beginning a unit on World War II, we discuss nationalism and civil war in China. My lesson on this time period involves a brief PowerPoint with cloze notes, primary source analysis (of course), and an original short story to encourage students to consider appropriate ways to approach a subject that sadly plagues the remainder of the course—genocide. It is my goal to humanize these events for the students, not to look at gruesome pictures and tut-tut the actions of the perpetrators, or worse….Fiction delivers lessons that are more palpable than lectures. Often times, students don’t even realize that it is a lesson. Fiction allows students to draw their own conclusions, often through empathy. STEAM in the classroom. So, my favorite kid is world history, I’ll admit it. But it dawned on me as I was writing this—perhaps it’s my favorite because it offers me the opportunity to bring in the elements that I also love about the other five, which are also near and dear to my heart.